MY UTMOST FOR HIS HIGHEST VOLUME 2: THE COVENANTThis superb new companion to the original MY UTMOST recording focuses on the great covenants chronicled throughout the Bible. It offers contemporarymusic of praise and adoration from artists such as Michael W Smith, BeBeWinans, Anointed and Susan Ashton, woven together by the sounds of the London Session Orchestra. 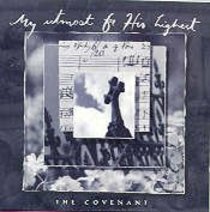 About "My Utmost For His Highest-The Covenant"